Pte. William W. Peascod, 8th Bn. The Border Regt. Driver Nellie Taylor, 10th Motor Ambulance, V.A.D. Found inside St Oswald’s Parish Church, Grasmere. 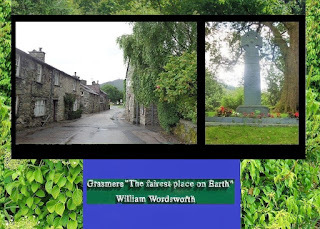 Grasmere, according to the English Romantic poet William Wordsworth (1770 – 1850) is “… the fairest place on Earth”. On the left of Photograph No. 1 (above) is the view looking north from outside Dove Cottage and the Wordsworth Trust Museum at Grasmere. In the background is Helm Crag with the rocky outcrop known as “The Lion and the Lamb” on the summit. This is the heavenly countryside which has inspired generations of poets, writers and artists: certainly since the time of Wordsworth and other “Lake Poets”, such as Samuel Taylor Coleridge, Robert Southey, Hartley Coleridge and Thomas De Quincey. The Vale of Grasmere, its village, its lake, its writers, poets and artists are known the world over. Visitors – or perhaps one should more rightly use the term pilgrims – from many lands come to Grasmere to visit Dove Cottage, home of William and Dorothy Wordsworth and the Wordsworth family between 1799 and 1808, and visit the graves of the Wordsworth family in Grasmere churchyard. Also found in Grasmere is the Heaton Cooper Studio, home of the gallery of the highly respected Heaton Cooper family. The Heaton Coopers, and especially Alfred Heaton Cooper (1863 – 1929) and his son William Heaton Cooper (1903 – 1995), are well known for landscape painting in the English Lake District, while Ophelia Gordon (nee Bell) Heaton Cooper (1915 – 1975), wife of William Heaton Cooper, was an accomplished sculptor. Yet, there is more to Grasmere than poets and painters inspired by Nature in times of peace. Walk around Grasmere and a number of war memorials can be found, particularly from WW1 and WW2. For example, the Celtic Cross seen on the right in Photograph No. 1 is a WW1 memorial found in Grasmere’s Recreation Ground. It was designed by the artist and sculptor W,G. Collingwood (1854 – 1932) and, even if it were not a war memorial, it should be regarded as a significant sculpture. The memorial verse at the base of Collingwood’s WW1 Grasmere war memorial was penned by the poet, writer, conservationist and Anglican clergyman Canon H.D. Rawnsley (1851 – 1920). At the time, Canon Rawnsley was living in retirement at another of Wordsworth’s former homes at Grasmere, Allen Bank. Canon Rawnsley was a close personal friend of President Woodrow Wilson of the United States. Canon Rawnsley even met with President and Mrs Wilson at Carlisle at the end of 1918 shortly before the president and his wife travelled to France for the Paris Peace Conference which opened on 18 January 1919. The eventual outcome of this peace conference was the Versailles Peace Treaty (signed 28 June 1919) and ‘Peace Day’ (celebrated 19 July 1919). In addition, wars and conflicts have influenced Grasmere’s poets, writers and artists from the Napoleonic Wars to the present day. A strong case can be made that William Wordsworth was a ‘war poet’. Indeed, the Wordsworth Trust Museum and Gallery at Grasmere held a special exhibition in 2015 focusing in this aspect of Wordsworth’s writings (“Wordsworth, War and Waterloo”, March – November 2015). In the early days of the Second World War, evacuees from London’s Royal College of Art (RCA) were based in and around Grasmere. Many of these artists served in the Grasmere Home Guard or one of the other civilian defence units. One significant reminder of this is a painting in the Imperial War Museum’s WW2 collection entitled “The Grasmere Home Guard” by Professor Gilbert Spencer, R.A., R.C.A. (1892 – 1979). Professor Spencer, who had served with the R.A.M.C. in the First World War, was known for landscapes, portraits, murals and figure compositions. Let us now consider Grasmere’s WW1 and WW2 War Memorials in greater detail. This study of Grasmere’s war memorials begins at the village’s recreation ground off Broadgate. The first thing to look at is W.G. Collingwood’s First World War Memorial which has already been referred to. It can be seen on the right-hand inset of Photograph No. 1. William Gershom Collingwood was an important literary and artistic figure in the late 19th and early 20th Centuries. For several years he had also acted as secretary and assistant to the Victorian art critic, writer and poet John Ruskin (1819 – 1900). Collingwood was also a close friend of the English author and journalist Arthur Ransome (1884 – 1967), who wrote the ‘Swallows and Amazons’ series of children’s books set in the Lake District. In fact, Arthur Ransome used the names of some of Collingwood’s grandchildren for his characters in ‘Swallows and Amazons’. Collingwood’s design for the Grasmere war memorial is in the form of a Celtic Cross, doubtless due to a large part because of his study of the pre-Norman Celtic crosses found throughout the Lake Counties. He design was made into a Celtic Cross by William Bromley, a stonemason from High Hill, Keswick (in northern Lakeland). Canon Hardwicke Drummond Rawnsley was secretary of Grasmere War Memorial Committee. It was Canon Rawnsley who penned the verse at the base of this memorial. However, Canon Rawnsley did not live to see the memorial unveiled. He died at Grasmere on 28 May 1920. It was almost exactly a year later, on 15 May 1921, that the Celtic Cross was unveiled in the Recreation Ground by the Bishop of Carlisle. Although no names are listed on this memorial, it was amended after the Second World War to include that conflict as well as the First World War. Not for themselves, for freedom, home and right. “See ye to it that they should not have died in vain”. There are two ‘peace trees’ trees in the meadow of Grasmere Recreation Ground. The first was planted in 1919 at the end of WW1 and the second was planted in 1995, 50 years after the end of WW2. Both are marked by an inscribed piece of Lakeland slate. Grasmere’s Parish Church (Church of England) is dedicated to St Oswald [Photograph No. 2]. William Wordsworth, his wife Mary, his sister Dorothy and other members of the Wordsworth family are buried in the churchyard. According to tradition, the first Christian church was erected here about 642 A.D. The oldest parts of the present building are believed to date from the 14th Century. On the south wall of the church is a tablet of Lakeland slate commemorating the parishioners of Grasmere and district who lost their lives in the World Wars [Photograph No. 5]. In the middle is an image of a Celtic Cross, recalling to mind the Collingwood war memorial on Grasmere’s Recreation Ground. The WW2 names were added at the bottom of the original memorial after the war. This article is dedicated to the parishioners of Grasmere and district who lost their lives in the World Wars. (b) ‘Grasmere Home Guard’ by Gilbert Spencer, R.A.